A Bloody Mary is a popular cocktail containing vodka, tomato juice, and usually other spices or flavorings such as Worcestershire sauce, Tabasco sauce, beef consomme or bouillon, horseradish, celery, olive, salt, black pepper, cayenne pepper, lemon juice, and celery salt. Left: A Bloody Mary garnished with lemon, celery, olive, cheese, and a cold cut. Served on the rocks in a pint glass. The epithet "Bloody Mary" is associated with a number of historical figures—particularly Queen Mary I of England—and fictional women, especially from folklore. It is believed that inspiration for the cocktail was the Hollywood star Mary Pickford. Other sources trace the name to a waitress named Mary who worked at a Chicago bar called the Bucket of Blood. The name likely refers to the blood-like color of the cocktail. 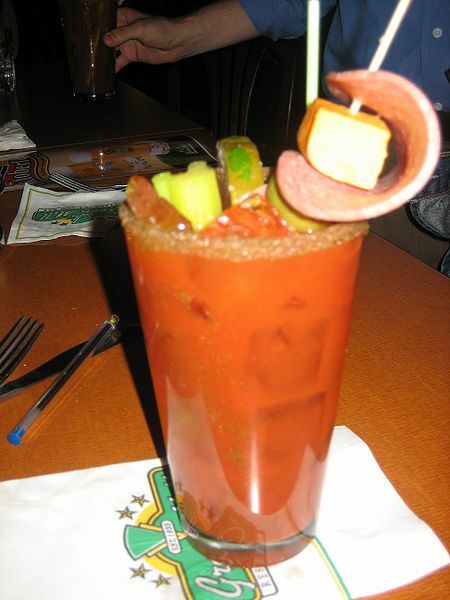 The Bloody Mary is intended to cure hangovers and so is generally served in the morning.